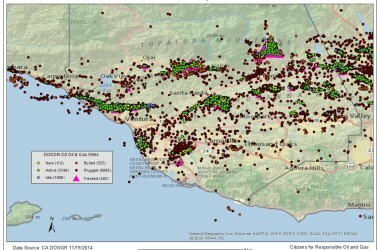 People across the south central coast have for years been voicing concerns about hydraulic fracturing (fracking), the process by which sand, water, and an unknown cocktail of chemicals is forced down an oil well to fracture rock, and acidizing where hydrochloric and hydroflouric acids are injected to dissolve rock and access oil. So Ventura updated its oil application process to require new drilling proposals involving fracking or acidizing to provide detailed information, including the source and amount of freshwater used, and disposal methods for frac flowback and other wastewater. However, an EDC investigation found that between 2012-2014, the County unlawfully exempted 95% of all oil wells – more than 400 wells – from discretionary review or application of modern County ordinances, including the new fracking and acidizing rules. The County allowed this unregulated drilling because the wells operate under old, “antiquated” permits that were in many cases first issued in the 1940s, 50s, and 60s! Due to an opinion issued by County Counsel finding that oil companies have “vested rights,” the County has neglected to apply environmental or land use laws to regulate these wells, which are in both densely populated urban areas and largely undisturbed natural areas. This County policy has in essence permitted oil companies to drill as many wells as they want, wherever they want, in perpetuity, without additional discretionary review. EDC submitted a letter to the County asserting that they are greatly overstating the scope of vested rights held by the oil companies, and unconstitutionally delegating the County’s duty to protect the health and safety of local residents. Although EDC hopes that its letter will prompt a proactive response from the County, we are exploring judicial avenues for compelling much stronger local oversight of oil production in Ventura County. EDC has provided the County with a series of recommendations for how to amend this process but is prepared to take legal action if insufficient changes are made.